Now that sun have killed SXCE and in doing so probably the future of the Solaris platform, I’m undoubtedly going to need a opensolaris box to play with..
file systems should be in the new boot environment. Updating boot environment description database on all BEs. Creating configuration for boot environment . Source boot environment is . Cloning file systems from boot environment to create boot environment . Creating snapshot for on . Creating clone for on . Setting canmount=noauto for in zone on . Saving existing file in top level dataset for BE as //boot/grub/menu.lst.prev. Population of boot environment successful. Creation of boot environment successful. Next, check everything is there. Mount it, and rm everything from it. Finally, lets share this out over NFS. Now for the Opensolaris install. 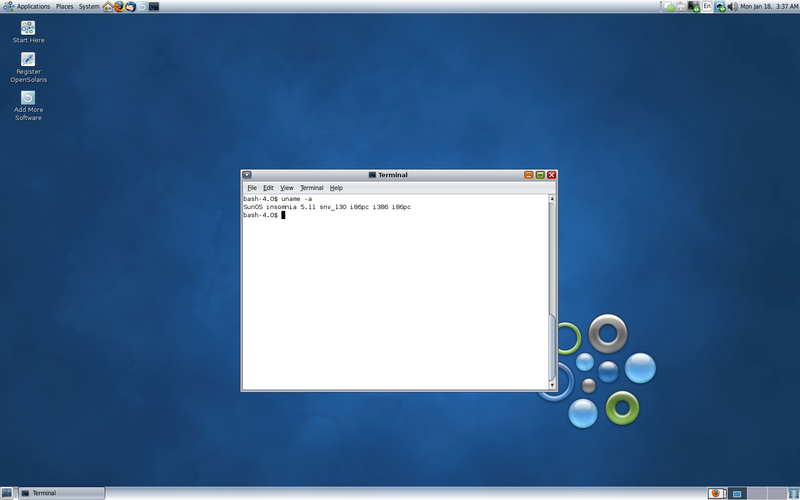 Download and install the latest opensolaris (at the time of writing, build 130) and get it inside VirtualBox. I did nothing particularly unusual here, standard 64 bit VirtualBox vm with 768mb of memory. Once the installer completes, we don’t want to reboot.. Select ‘quit’ instead of reboot, and open a term. YMM (hopefully) V on the amount of time this takes to complete… Well over three hours. Ehehem…. So, once this finally completes, we can shutdown the vm and leave it alone..
root@insomnia:/a/etc > cp /etc/path_to_inst /etc/zfs/zpool.cache /etc/driver_* . I hit an issue here, where, as the username I had created for my user account in the installer was not the same as the one I used in the old BE so as such there was no home directory for the user. You probably want to fix this before you reboot, as thanks to whichever bright spark decided to remove the ‘console login’ option from GDM and worse still, disable the ctrl+alt+backspace hotkey, means you’ll need to boot back to your S10 BE to fix..
Reboot and be sure to choose our new BE from the grub menu. A short reboot later, and we’re in the OpenSolaris snv_130 BE! Notice how beadm plays with my S10 BEs. After a bit of irc inspired digging, I’ve built a newer rev of LSOF and fortunately, it appears that the upcoming 4.83 release restores functionality on Solaris which has been broken for a while! Will kick out some packages once it’s released. Logging in as anonymous … Logged in! ==> SYST … done. ==> PWD … done. ==> TYPE I … done. ==> CWD /pub/tools/unix/lsof/NEW … done. ==> PASV … done. ==> RETR lsof_4.83K.sun.tar.bz2 … done. header files and source files that should be present really are. to skip the inventory and customization steps with the -n option.